It was a rainy day when We Future Cycle did the “before recycling” waste audit at the White Plains Elementary School. Mountains of trash bags from lunch had been piled up just outside the building to be weighed and counted before being brought to the large container by Custodian Rob Dell’Orletta. Every single bag, bulging, dripping milk and being wet from the rain was weighed and results were added up. Post Rd Elementary school looked at 27 bags, weighing a total of 277 lbs. It was very messy and unpleasant. Mr Dell’Orletta was not surprised by the numbers, and confirmed that it is the normal amount, plus about another 6 from breakfast, usually, and some from after school. He smiled at me, with charming disbelief, when I shared with him that after source separation we will look at one bag weighing less then 5 lbs. Following classroom by classroom presentations to the students, and prior day presentations to all staff and adult players in the building, the big day finally arrived. Gone were the rows of large 55 gallon grey trashcans from the aisle between the table, gone where the bulging black plastic bags, hanging over the handle of the bins, to have quick replacements at hand. Mr Dell’Orletta looked somewhat worriedly when he saw me removing all his prepared replacement bags. 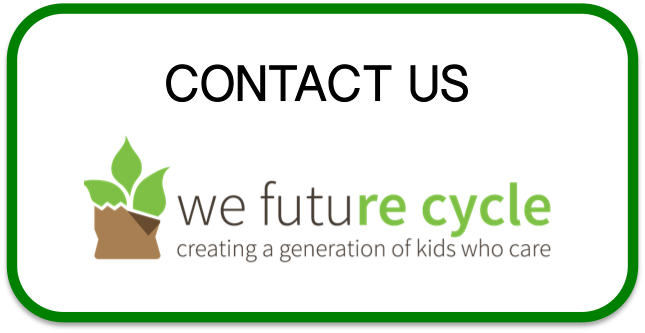 We Future Cycle set up two recycling stations against the far side of the lunchroom, removed all large barrels, with its black bags and replaced them with smaller colorful bins, clear bags or no bags, and large signage on what each bin is for. I did not put any replacement bags on handles, explaining that I did not think we will need to empty any of them until the very end of lunch. Another disbelieving, but very hopeful smile from Mr Dell’Orletta. Lunch time came and went, and as with all first days to teach 650 students to sort, it was a blur. All the rest was either excess liquid, recycling, composting or untouched food to be donated to the local soup kitchen. Ms Ossorio, principal, was giddy with pride and joy, and rightfully so, her students just proved that making a difference is very possible. And Post Rd students did it in a timely fashion too, on the first day! That is truly something to write home about. This it what 857 plastic bags look like, strung up on a clothes line, and spread out to make a powerful statement. It is truly a mind boggling amount. It took 7 children two lunch periods to string them all up. New Rochelle Columbus students are learning just HOW bad plastic bags are for our environment and how the small effort of bringing your own bag to the grocery store can make a huge difference. In powerful essays, these students laid out just how easy it is to solve this problem, just bring your own bags. New Rochelle Columbus Students are diving deeper and deeper into sustainability education and they are loving it. We Future Cycle in collaboration with the St. John’s Episcopal Church on Wilmot Rd in New Rochelle sponsored a “How Do Plastic Bags Affect Our Environment” Research Essay Contest, open to 4th and 5th grade students. Science Teacher Elizabeth Zahn taught in Science Lab the life cycle of plastic. Students learned that it took millions of years for minerals to be compressed to become oil, which is the basis for plastic production, whereas it only takes 3 seconds to make a plastic bottle. And this plastic bottle will take 1000 years before it goes away. Ms Zahn skillfully walked the students through the realization, that saying it takes 1000 years to go away is really a way to say forever. And that is truly what it is, plastic will NEVER biodegrade, it only photo degrades into smaller pieces of plastic that make it into our food chain and are impossible to clean up. Students researched the topic, wrote an essay about their findings and the judges Irene Schindler and Jennie Talley had a hard time choosing the top 8 entries among the record breaking 90+ participants. Nearly all 4th and 5th graders took the opportunity to enter. They knew from last years writing contest that Cash could be won! Ms Nunez, Principal shared nuggets of wisdom from each winner’s essay with the applauding crowd and the students were very proud to receive their certificate and envelope, get a hug from Ms Owens, AP, and have their picture taken. Here is a profound observation by Valeria Mendez 5th Paradiso. Naydelin Garcia Alonso, (5th Paradiso) understands that it takes all of us to solve this problem. Evelyn Madrid (5th Paradiso) understands the basic underlying reason for this problem is within us and how we value money. Jason Zheng (5th Paradiso) knows that nobody is too little to make a difference. Darien Chen (4th Guadanini) understands that every little bit helps, and what might look small for us, is a big thing if everybody does it. Mia Torres (4th) has done some research on the long term effects of our current consumption projectory and she encourages all her classmates to let their voices be heard. You go, girl! Arianna North (5th Pomerantz) is realizing that littering is not just bad for the environment but it also costs us all a lot of money. Money we could find much better uses for. New Rochelle Trinity Elementary School Assistant Principal Inas Morsi Hogans has been for years a stout supporter of the We Future Cycle recycling program and knows that it takes regular refreshers for students to understand why they are sorting their lunch waste in the cafeteria. Only if our head knows the why, the hands will do the what automatically. Ms Morsi Hogans invited We Future Cycle to do student presentations in each classroom to refresh the older grades on how the program works, and of course to teach the younger grades. We Future Cycle staff members went from class room to classroom teaching the students that an empty bottle or peanut butter jar is not trash, but rather material to make something new out of. The students were fascinated to learn where “away” was, when one talks about throwing something away. In Westchester, “away” is the incinerator up the Hudson in Peekskill. A large Waste-to-Energy facility that burns Westchester’s 2500 daily tons of garbage into our air. A regular lunch trash bag is a 55 gal 1mm thick trash bag. A school with 600 students generates between 13 to 20 bags of trash every lunch, each weighing around 12 -15 lbs, which means 333,333 bags of trash are burnt every day. That is an unfathomable number. I cannot even wrap my head around what kind of volume that represents. And that is just Westchester. And New Rochelle Trinity students are drastically reducing their lunch waste by sorting. Out of 266 lbs of waste, only 4.5 lbs were non recyclable. That is a whopping 98.3% reduction, simply by sorting out all the recycling, composting, excess liquid and the untouched foods. Through education and daily hands on participation, Trinity students care and they are making a huge difference. Can you just imagine if EVERY school did that? We Future Cycle is working towards just that.